One of the nice things about getting older is being able to remember events as they happened. And, for each of those events, there usually sticks in the mind an image that forever remains a kind of shorthand for the whole thing. Such an image lingered in the back of my mind when I recently did a post on an EK Holden wagon; I knew the image was there, but it eluded me at the time. Well, it took a few weeks to surface, but now it has I think it’s well worth sharing. I think these pictures give you the general idea. 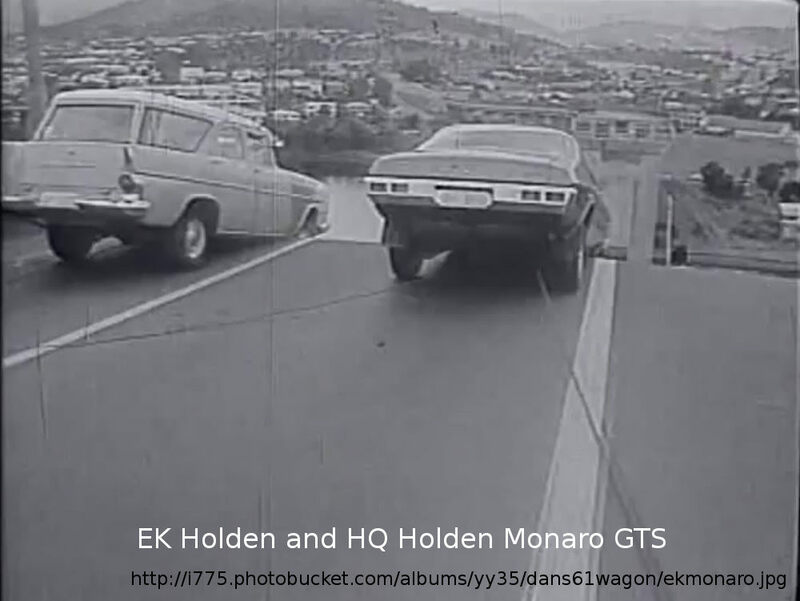 The image is of an EK Holden wagon and another car forever perched on the edge of the partially collapsed Tasman Bridge, in Hobart, Tasmania. (Tasmania is Australia’s island state, at bottom right on the map). 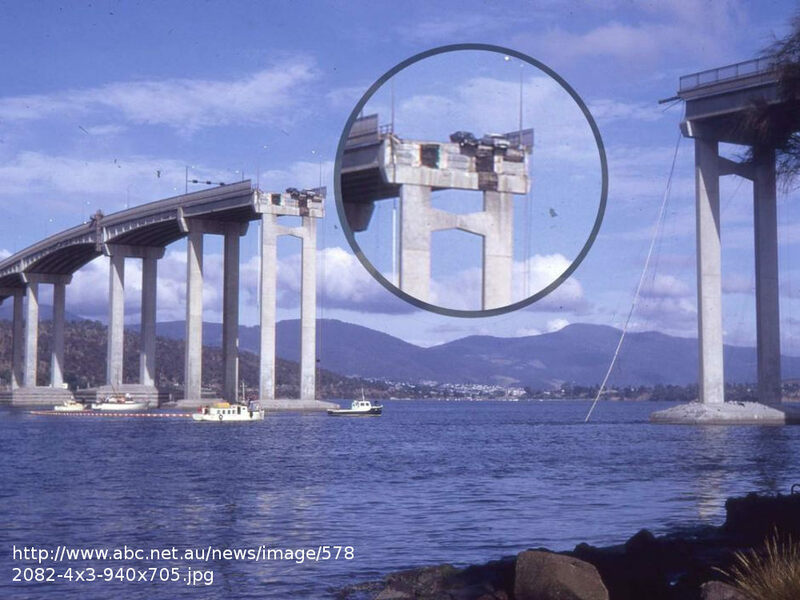 On the evening of 5 January 1975, the captain of the Lake Illawarra let his vessel collide with some of the bridge supports. A large part of the deck fell into the Tasman River. Seven crewmembers were trapped in the sinking ship, and five unwitting motorists went over the edge. 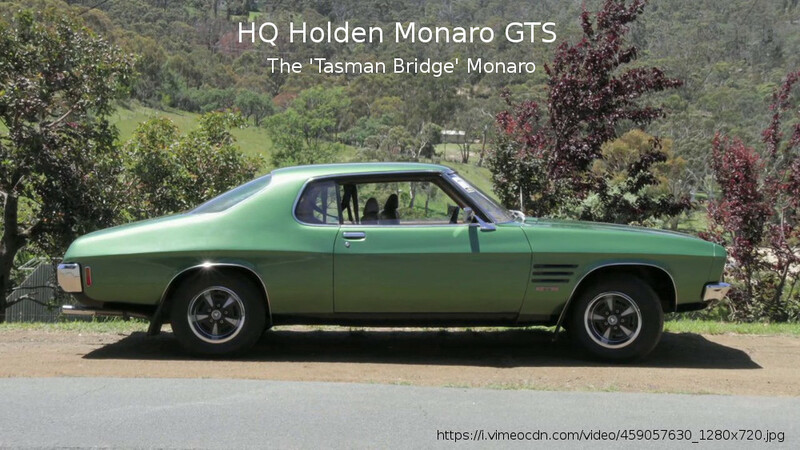 I haven’t been able to determine the fate of the EK, but the other car, an HQ Holden Monaro GTS, is definitely alive and well. The couple in the Monaro that night, Frank and Sylvia Manley, kept the car and it still looks a treat. Frank and Sylvia tell their story in this short video. The HQ range brought the second generation Monaro. The sporty ‘GTS’ was one of three variants initially available when the HQ range was released in 1971. The others were the basic, hose-out Monaro (no suffix) and the luxury-oriented, chrome-laden ‘LS’. A four-door Monaro GTS (i.e. a tarted-up version of the HQ family sedan, the Belmont/Kingswood/Premier) came along a bit later. Wow. Saw a tour bus in that shape after the Kyoto earthquake. Good for a whole batch of puckers. Yikes! Looks like a definite seat staining moment for both drivers. Good lookin’ Monaro. 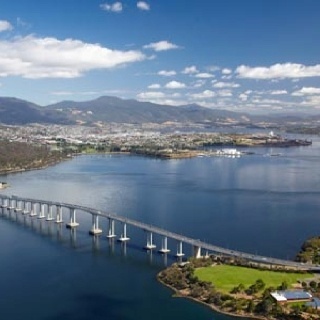 I used to cross that bridge on my commute Cygnet to Lindisfarne and always remember that image though it never fell down during my stay in Tassie. +1 more Aussie iron please! Demonstrating once again the common design language of GM products the world over, the side view looks a lot like a 1971-72 Pontiac LeMans. EXACTLY what I thought! And the Pontiac style Rally wheels make it even more so. It costs a reasonable pile o cash to buy one of the survivors in OZ plus shipping and handling. There’s a gorgeous gold GTS on ebay.au with a $70k AUD Buy-It-Now. Yikes!!! Yikes! Reminds me of the Tampa Bay Sunshine Skyway Bridge collapse in 1980 after a ship hit one of the piers. This photo shows a 1975 or so Buick Skylark that managed to stop just 14 inches before the abyss. Unfortunately, a Greyhound bus and several cars did fall into the water, with 35 deaths reported. 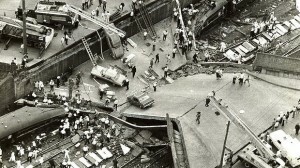 Also the 1989 Loma Prieta (SF) earthquake, in which a 50′ upper deck of the Bay Bridge collapsed, with one fatality. I remember footage of several cars falling into it. Any mention of cars & bridges must include the notorious Tacoma Narrows Bridge (aka Galloping Gertie); there’s newsreel of cars crossing it despite extreme aeroelastic oscillations. The film is standard fare for science & engineering students. That photo of the Buick was the first thing I thought of, too. The link below has more information about the incident, including (at the risk of being morbid) a surprisingly detailed description of all the vehicles involved, in most cases including make, model, year and color. The Buick is identified as a 1976. One motorist actually went over the edge but survived. 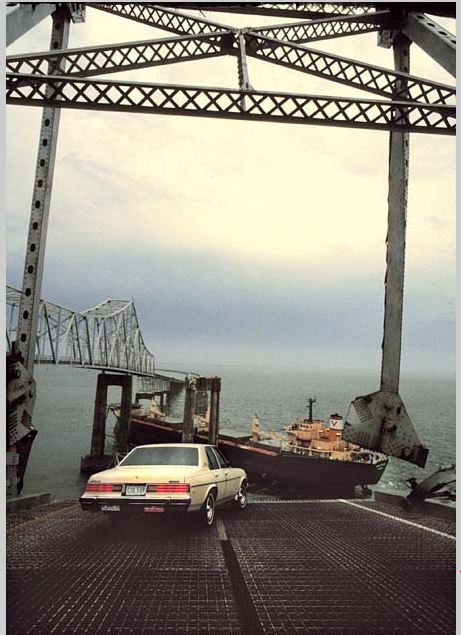 His 1974 Ford Courier landed on the deck of the ship that had struck the bridge support, then rolled into the water. This apparently made his impact with the water less violent/deep than those of the people in the other vehicles, enabling him to get out of the water alive. That’s really scary, as any type of bridge incident usually is. Also the Minneapolis bridge. It fell not too long after I had been in Minneapolis, but I did not cross it at the time. Included among the “Useless Information” listed on the back cover of Monty Python’s Previous Record was, “Hobart, Tasmania was founded in 1804.” I like Useless Information, you never know when it’ll come in handy. I have never seen this before. Yikes! Not as harrowing, but this is the I-35 collapse in Minneapolis. Note the van, which careened into the concrete barrier to come to a stop. Not sure if it was necessary, but probably a good idea. On the I-35 collaspe there was also this bus which was full of kids. Note the semi just to the left and in front of it, whose driver was killed. I believe an adult on the bus was seriously injured but everybody survived. Interesting story, and interesting comments from readers reminding us of similar events. They should be good for a couple nightmares this evening. Around 1975 in Philadelphia, my aunt and uncle closed their bar on New Years morning after a long night. My uncle fell asleep on the drive home and drove off the Penrose Avenue Bridge. The pedestrian handrail passed through the top of the windshield, peeled the roof back, and partially scalped him. The handrail broke free of one of its mountings, and the car continued over the side of the bridge. But the handrail held fast at the other end, and the car was hooked at the C-pillar. The car then tipped vertically downward, pointing at the pavement 80′ below. A tow truck driver following just behind hooked onto the car in the hope of keeping it from going over, but it could not risk trying to pull the car back up. My aunt and uncle were suspended in their al fresco coupe, staring at the pavement below. My uncle was bleeding rather profusely on the dashboard (the newspaper photos the next day were rather gory), and my aunt was pinned on her side of the car and could not help him. A couple hours later, a hook and ladder truck long enough to reach them was found, and they were rescued from below. Had the accident been on the part of the bridge over the Schuylkill River, I suppose a rescue may have been impossible. They both had some lingering health effects from the accident, but my uncle died only two years ago. My aunt is now about 80 and looks around 55. For 40 years, I have not been able to think of them without thinking of the accident. Wow, I found the news story. It happened in 1980, and the drop was “only” 50 feet, not 80 feet. Wow, indeed! That’s a helluva story! It’s a casebook example of a phenomenon I have seen many times in my life, that of being simultaneously very unlucky and incredibly lucky at the same exact moment. Bugger! What the hell happened? 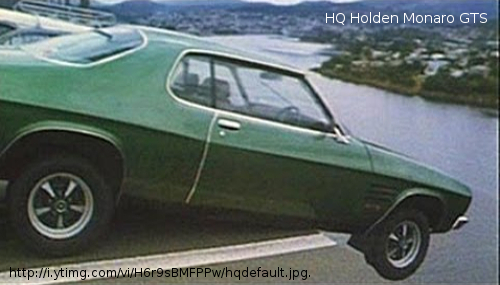 It looks like part of the Tasman Bridge had broken away, both forward and aft of the two Holden cars in the pics. How that happened, I’ll never know. Was there an earthquake that shook that day? A 7,500 ton ore-carrier ship ran into two the bridge piers, after running wide (currents & inattention) and missing the central span that it was supposed to pass through. Seven of the ship’s crew were killed in addition to the motorists who went off the bridge. This is what it looks like today, note the larger gap between piers when the bridge was repaired. Also the wreckage of the ship still lies under the bridge because it is not a navigational hazard. One bridge collapse that I remember was that of the Silver Bridge connecting Point Pleasant, West Virginia with Gallipolis, Ohio across the Ohio River. 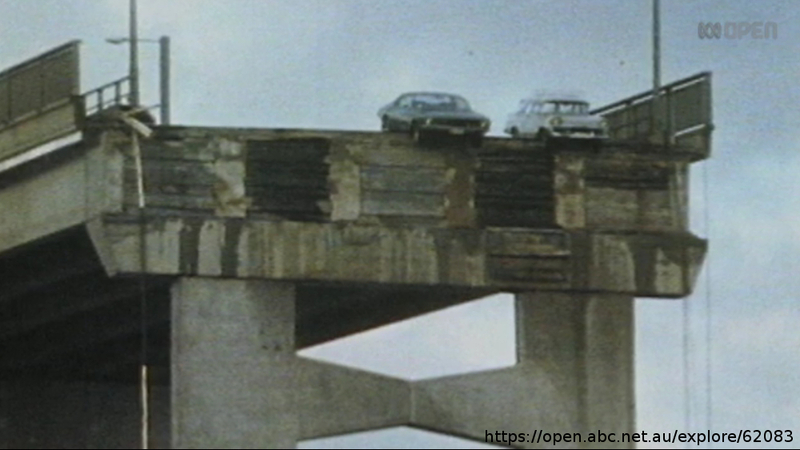 The bridge collapsed during rush-hour traffic only 10 days before Christmas 1967. I was living in the Pittsburgh area not too far away, so it was a major news story at the time. Very tragic, with 46 lives lost. It seems to also fall in with the Mothman Prophecies legend. Legend has it that Mothman was seen flying about that same area from 1966 to December 1967 and after the collapse of the bridge, it was seen no more. It was speculated that the creature was trying to warn folks of the danger. But between you and me, I don’t believe a word of the Mothman legend. 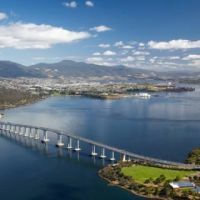 @Jason – Reading the entire CC entry will help: On the evening of 5 January 1975, the captain of the Lake Illawarra let his vessel collide with some of the bridge supports. A large part of the deck fell into the Tasman River. Seven crewmembers were trapped in the sinking ship, and five unwitting motorists went over the edge. In 1980, I was on Amtrak’s Silver Meteor on my way to Florida on vacation – Wifey’s parents flew her and our son down previously – the train ride was part of MY vacation! In the dining car that evening, a few younger guys were my tablemates, and we were talking about the Sunshine Skyway bride collapse. On of the fellows was in the last car over the bride before it went down – He witnessed the Greyhound bus go over. Our collective jaws dropped on the table when he told us of that account. Having driven over the new Sunshine Skyway bridge several times since, the remnants of the disaster still remain. Still sobering when I think of that horrible event. Did I ever tell you about my fear of open heights? The EK is in Queensland now according to an article in the latest issue of Australian Muscle car magazine.